Created as a piece of art, a ‘snap shot’ of the town centre today. The internet and out-of-town shopping centres have massively affected traditional shopping centres. The largest two categories of businesses are places to eat and takeaways (10%), then ‘beautification’ (hairdressers, barbers, nail salons and tattoo parlours) at 7%. Sadly 14% of shops are empty. Interesting to see how much shopping has changed in 50 years – see the next post of the same area in 1968. 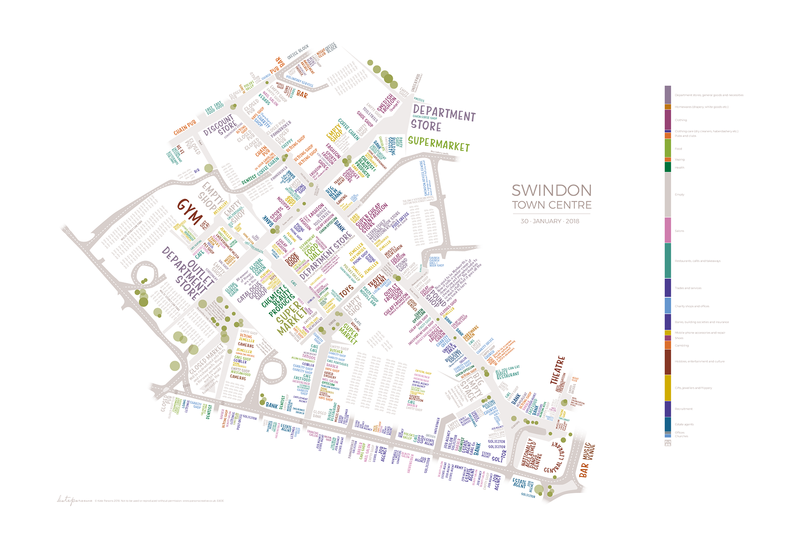 There is also a similar map of Swindon’s Old Town (and I will do a 1968 comparison once I get hold of the reference material!). Signed prints, 90cm x 60cm, on good quality 180gsm paper are available for £28 at The Library Shop, Regent Circus, Swindon. There is a copy of this map in the Library’s Local Studies department if you’d like to take a closer look. I’ve given a copy to Swindon Alzheimers Society which they’re going to use at their memory talks.